Celebrities swear by Tag Heuer watches and if you purchase this Tag Heuer Formula 1 women’s watch, you’ll know why and experience the elegance, beauty, and dependability of Tag Heuer watches for yourself. This classy watch will keep you in style, on time, and the center of attention. This stunning timepiece will transform your look. It adds a layer of sophistication that an ordinary accessory will just not be able to do. The look, the quality, the finesse, and rich history of the brand are all part of the charm and beauty of this timepiece. This watch has an attractive stainless steel bracelet that has black tone ceramic in the center. This 6 inch adjustable bracelet will be sized freely by the manufacturer for you if it is too big or too small for your wrists. The polished steel case matches perfectly with this bracelet. 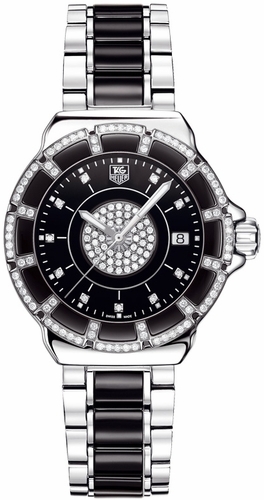 You will immediately notice the full cut diamonds (148 to be exact) that adorn this watch. There are diamonds set on the bezel as well as the black dial and are strikingly beautiful. The case measures 37 millimeters in diameter, which is large enough to allow you to appreciate these beautiful features of this watch. Luminescent hands and markers can be seen nicely contrasted against the black dial as well as diamonds at the hour marks. The date window at the 3 o’clock mark is easily visible and legible as well. The list price for this watch is $4700, but some online stores are offering it for as low as $3400. If you decide to purchase this watch, shop around before you make your final decision to get the best deal. This is a great price for a watch that has so much history, finesse, and beauty as this one does. 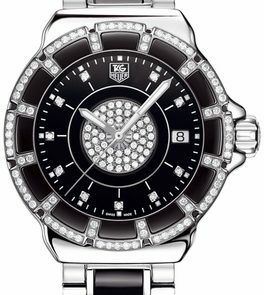 When you purchase luxury watches such as this Tag Heuer Formula 1 women’s watch, whether you are adding to a collection or branching out and trying something new, you are making a statement. It is an obvious status symbol that will define you. The distinctive styling, grandeur, and beauty of this watch will surely make a bold and confident statement about you and your style for years to come.